Bull Statues - Click on an item for more details! This beautiful Silver Bull & Bear Marble Pen Holder is made of silver and marble with stunning detail finish, a perfect gift for the corporate awards. Silver/Marble, 2.5 inches H. x 11 inches W. x 5.25 inches D.
This exclusive Bull Desk Clock is made of brass and wood with stunning detail finish, a perfect gift for the corporate awards. Brass/Wood, 9 inches H. x 10 inches W.
This Bronze Bull Head on Marble Sculpture is handcrafted with the highest quality and innovative design in mind and represent a unique value while beautifying any room at home or in the office. Bronze/Marble, 8 inches H. x 11.25 inches W.
This "Stock Market" Bull & Bear Table Clock is made of solid brass and burlwood with stunning detail finish, a perfect gift for the corporate awards. Brass/Burlwood, 6.5 inches H. x 14 inches W.
This Charging Bull & Bear Sculpture on Burlwood Base is handcrafted of bronze with the highest quality and innovative design in mind and represent a unique value while beautifying any room at home or in the office. 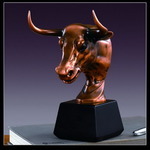 Bronze/Burlwood, 7.75 inches H. x 17.5 inches W.
This Raging Bull Sculpture is handcrafted of brass with the highest quality and innovative design in mind and represent a unique value while beautifying any room at home or in the office. Brass/wood 9 inches H. x 14.5 inches W.
This Bull & Bear Head Desk Clock is made of bronze and wood with stunning detail finish, a perfect gift for the corporate awards. Bronze/Wood, 12.5 inches H. x 5.5 inches W. x 6.25 inches D.
This Bronze Bull & Bear Fight Statue is handcrafted with the highest quality and innovative design in mind and represent a unique value while beautifying any room at home or in the office. Bronze, 9 inches H. x 9.5 inches W.
This Medium Bull & Bear Fight on Marble Base Sculpture is handcrafted of bronze with the highest quality and innovative design in mind and represent a unique value while beautifying any room at home or in the office. Bronze/Marble, 8 inches H. x 11.25 inches W.
This Charging Bull & Bear Fight Statue is handcrafted of bronze with the highest quality and innovative design in mind and represent a unique value while beautifying any room at home or in the office. Bronze/Marble, 6 inches H. x 16 inches W.
This Large Bronze Bull Sculpture is handcrafted with the highest quality and innovative design in mind and represent a unique value while beautifying any room at home or in the office. Bronze, 11 inches H. x 21 inches W.
This Medium Bull & Bear Fight on Marble Base Sculpture is handcrafted of bronze with the highest quality and innovative design in mind and represent a unique value while beautifying any room at home or in the office. Bronze/Marble, 18 inches H. x 20 inches W.